Kind of a lot going on this week here. Yesterday started off with much promise. I didn’t have to work, it was going to be 80 degrees, and I had plans to take Holland on a park picnic via bike for the first time this year. Then I heard it… drip… drip… drip. Water was dripping down from the ceiling near the dishwasher. I knew that upstairs was a broken toilet. Panic. I raced upstairs to find about an inch of water in the bathroom with more coming out of the toilet. With only a moments hesitation (it was toilet water, after all), I raced across the room and turned off the water. I threw every towel we owned, clean and dirty, onto the floor- and it was still a swimming pool. I even threw my terry cloth bathrobe in the water! I ran to the basement to get a bucket… more water. Make that two buckets. To make a long story short, from then on my day was consumed with bleach, laundry, and more bleach. I am praising God that I was home. The water was probably flowing for 10-15 minutes by the time I caught it. I cannot bear to imagine what would have happened if I had been gone, as I often am. We aren’t sure what we are going to do, but it will involve a new toilet, repositioning of pipes in the floor, and maybe tearing out some of the ceiling. Fun times. Holland and I did take a break and went on the park picnic by bike, and it was lovely. 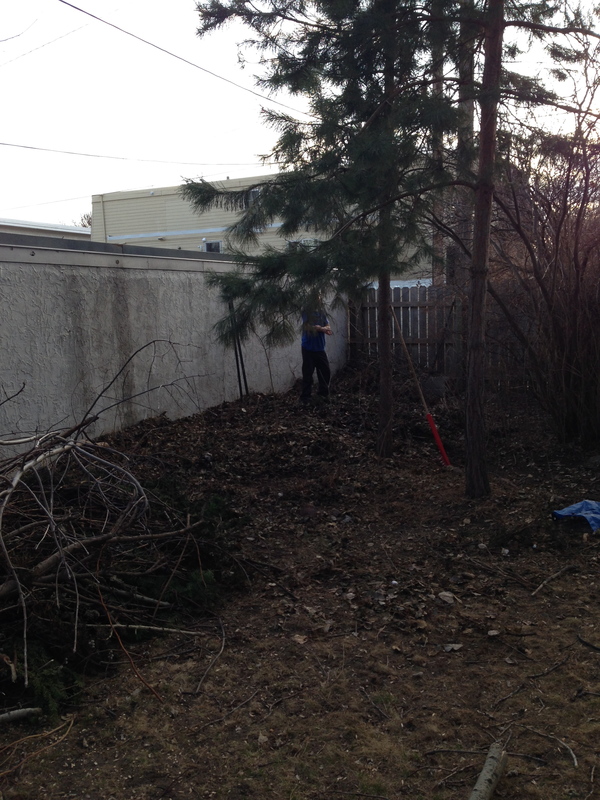 After everything was sorted out in the waste-water department, we did a ton of yard work to make room for the flock of chickens we hope to soon add to our backyard. In our backyard, there is a perfect little “nook” for chickens. 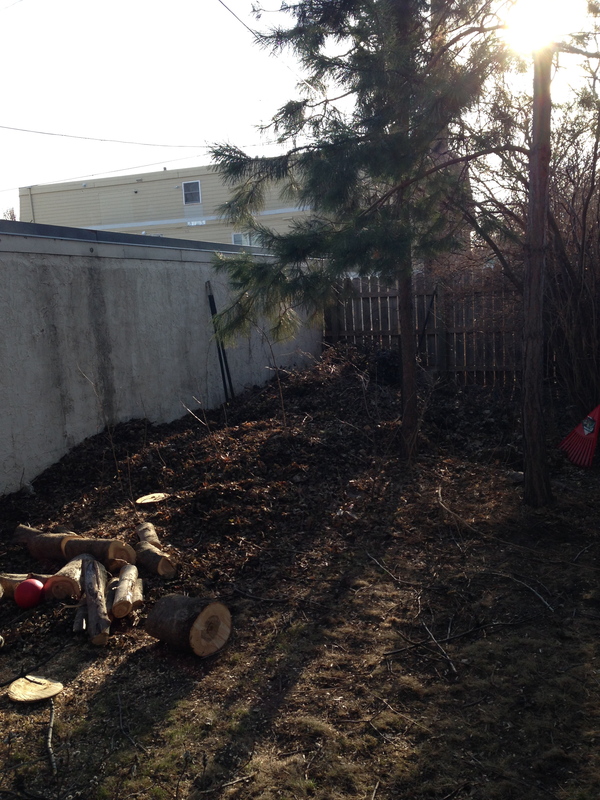 Unfortunately, the previous owners used this space to dump their yard waste… so we have 5+ years of leaves and branches to clear first. I’m sure it was very handy for them, but we have other plans for the space, and so have our work cut out for us. 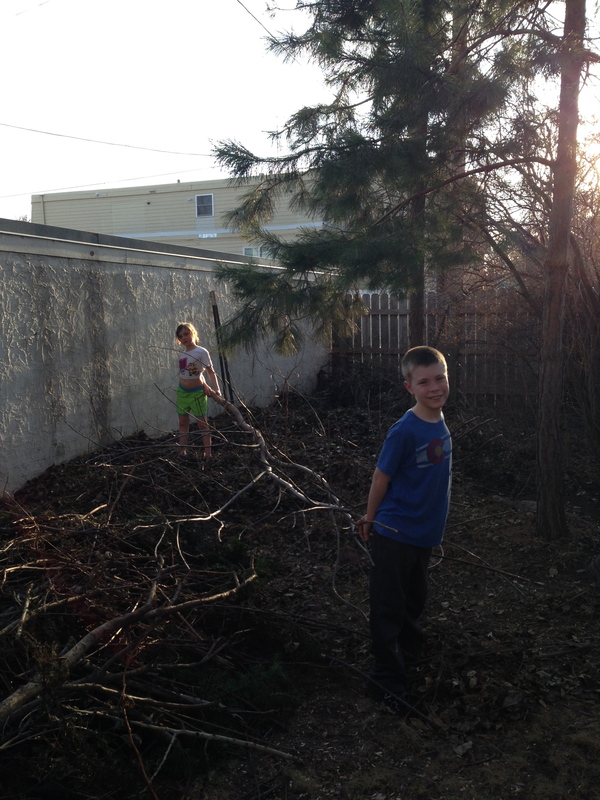 I told the kids they needed to help us clear branches. Fisher began to do so with his usual enthusiasm for work (subdued, to be sure). I then told him why we were clearing this area (for the chickens). “WAIT.” he said, “Do you mean that the sooner we get this cleared out, the sooner we get CHICKENS?? ?” With my affirmative, what happened next was a burst of work ethic like I’ve never seen before. He was an animal! It looks like livestock is the secret to unlocking my son’s initiative. Hmmm. After. Can you tell a difference? We still have much work to do. Amid all of the messes in my life this week, I have enjoyed gazing at my new wall-art. For years now, I have been storing 6 vintage French cruise menus, wondering what to do with them and how to do so cheaply, as they were a very non-standard frame size (9.5″ x13.5″). 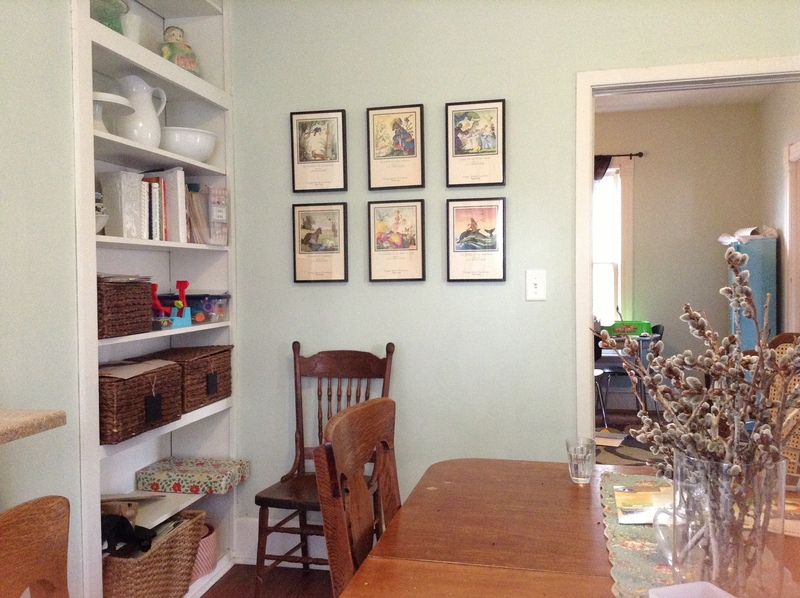 After a little Internet searching, I found some great frames from posterframedepot.com. With a coupon code, I got 6 frames for ~$90. They took about 10 minutes each to assemble. Here is the result! 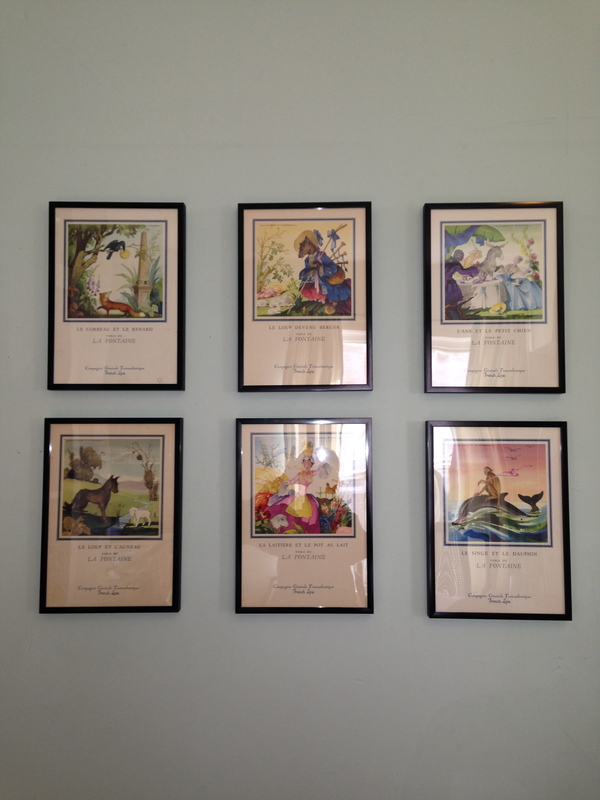 Each one features a watercolor of a La Fontaine fairy tale.